So, let’s get something straight from the get-go: I believe that store bought guacamole is a true crime against well deserving taste buds. So repeat after me: “This Super Bowl Sunday, I will buy fresh avocados and make my own guacamole from scratch.” See? That wasn’t too difficult now, was it? 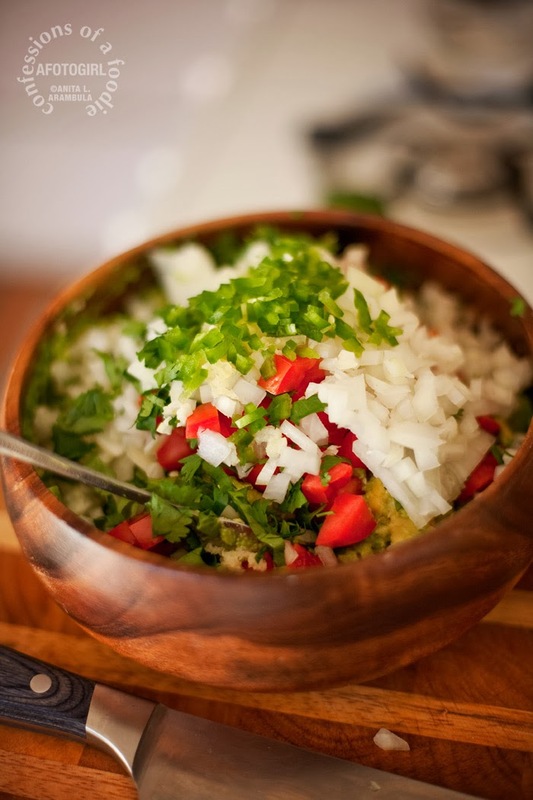 We can thank the Aztecs for giving us this tasty green creation in it's most basic form. 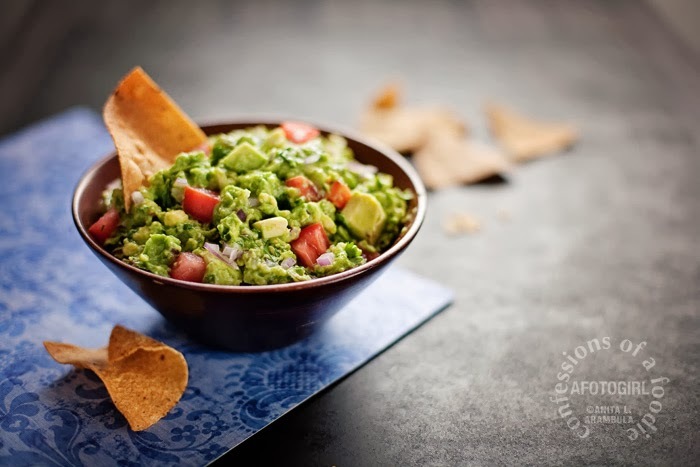 The word guacamole literally translates from their native Nahuatl language as “avocado sauce” and it's become one of the most popular dips in the United States. Seriously, close your eyes and imagine Super Bowl Sunday or even the very American celebrated Cinco de Mayo without guacamole. Am I not right? I did a little research online and discoverd that besides just being yummy, avocados give quite the nutritional boost. One cup of sliced avocado provides 2.9 grams of protein. That might not sound like a lot but according to Natural News, "avocados provide all 18 essential amino acids necessary for the body to form a complete protein." 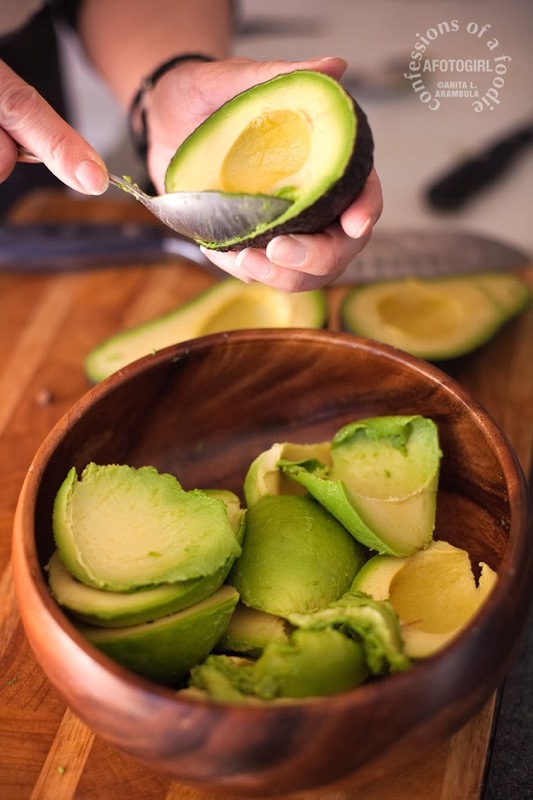 The avocado's fiber content makes the protein easier for the body to absorb (as opposed to animal protein that can be hard for some people to digest). Avocados boost good cholesterol in the body and along with being rich in heart healthy omega-3 fatty acids, they're high in beta-carotine which means they're high in vitamin A (eye health!) and their unique combination of nutrients act as an anti-inflammatory (good for those suffering from arthritis). I hate to admit this considering my well documented love of guacamole now but growing up, I hated avocados. We had a tree in the garden just outside of our kitchen. On any given weekend, it inevitably would fall to me to peel the fruit for my dad’s guacamole. I cannot stress enough how very much I disliked the feel of the naked fruit in my hand. I think I was well into my 20s before I succumbed to the avocado's seduction but sadly, by the time I was old enough to appreciate their heart-healthy creamy goodness, Dad had long since gotten tired of the falling fruit hitting the hood of his brand new car and had chopped the tree down. Fast forward to the adult me and I hardly go two days without avocado in some form or another: pitted with balsamic vinegar poured into the cavity left behind, diced as a filling in my omelet on the weekends, mashed onto a flour tortilla dotted with a little salt and pepper then rolled up burrito style, to name a few ways. My favorite way to enjoy it, though, is as guacamole, which kinda makes me laugh now considering how much I disliked it as a child. I make it basically the way Dad always has: avocados, cilantro, serrano or jalepeño chiles, onion, tomato and a squeeze of lemon or lime. I spread it on toast, top eggs, use it in a green salad as my dressing, spread it on sandwiches and of course, eat it straight up with chips. I like to make enough guacamole to last me more than one meal. I know what you’re thinking. How do I keep it from turning into that unappetizing brown mess? Some people swear by the “keep the pit in the bowl” method but taking a glance at the chemistry behind why it turns brown, this old wives tale is exactly that: a tale. Bananas, apples, pears, potatoes, avocados. What do they have in common? Well, according to my online research, they all contain an enzyme called polyphenol oxidase which reacts to oxygen, turning the fruit brown, essentially creating a "rust" like appearance. Of course, the fruit is still edible but because we eat with our eyes first, it’s not very appetizing. The best way I have found to slow down the “rusting” process is a combination of limiting the amount of oxygen the fruit comes in contact with and the introduction of an acid like lemon or lime juice which retards the oxidation process. 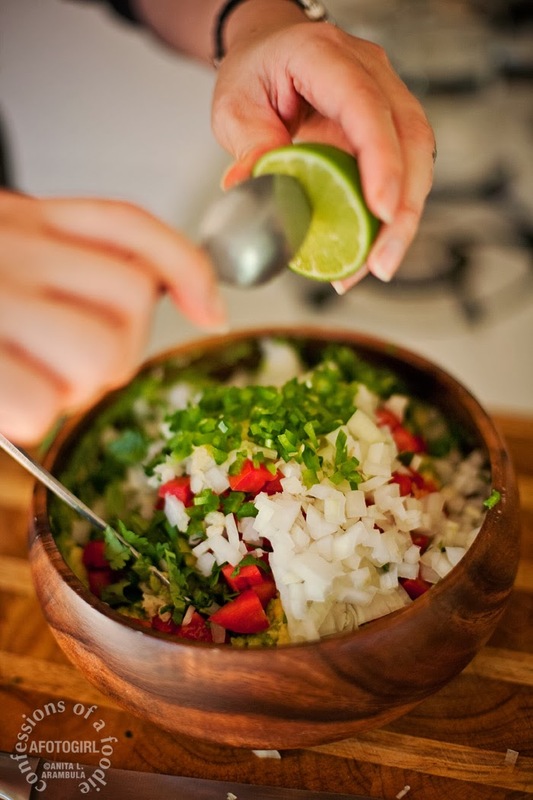 After I make the guacamole, I squeeze a little lemon or lime juice over the top of the dip. If I’m not going to eat it right away, I place the guacamole in an airtight container first and then squeeze the lime juice over the top. Next I cut a piece of plastic wrap large enough to cover the guacamole and come up the sides of the container. I press the plastic wrap onto the surface of the guacamole making sure the entire surface of the dip is in contact with the plastic wrap and I work out any air bubbles. 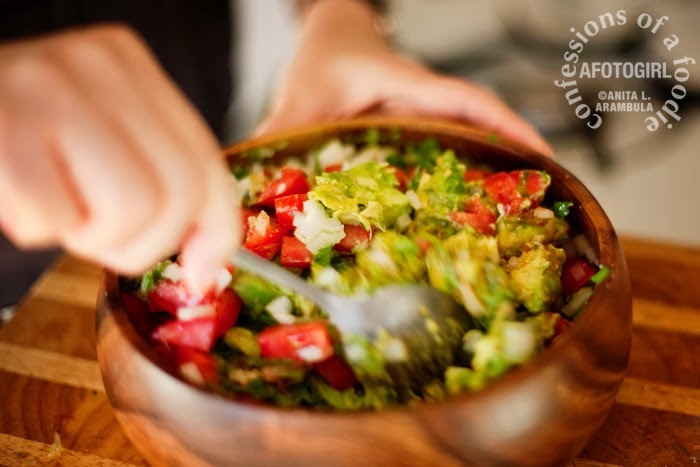 I pop the container's tight-fitting lid on and place the prepared guacamole in the refrigerator immediately. Each time I serve myself some of the guacamole, I repeat this process. Typically, I can keep the guacamole for two to three days before it starts to brown on me. Homemade guacamole is so easy. You can go basic: finely mashed avocados, salt, pepper and a little sour cream for taqueria style. Done. 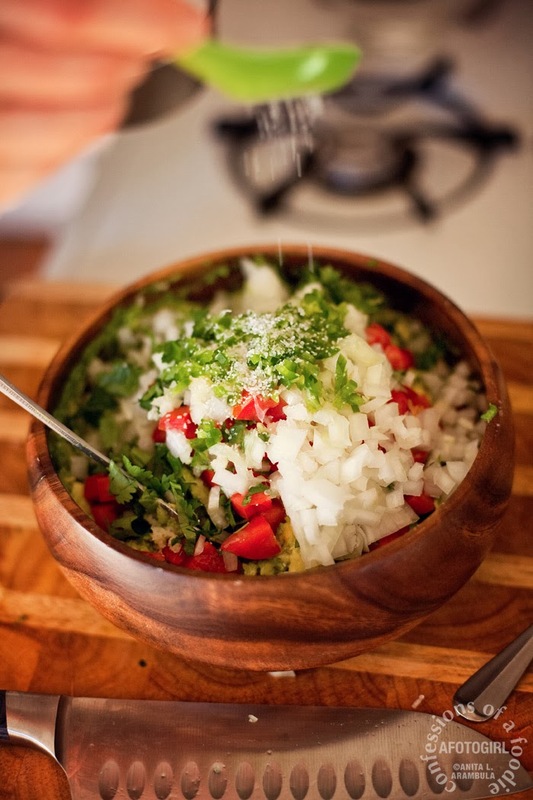 Or chunk jazz it up a bit with cilantro, onions, tomatoes, chiles and have it "Mexican style." 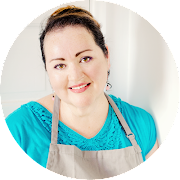 However you make it, just tell me you're gonna ditch the muddy tasting store bought guac and try your hand at the fresh stuff. I'm telling' ya, you and your amigos will be happy you did. If you've always bought your guacamole pre-made, you might not know how to tell if an avocado is ripe enough for your guacamole making adventure. Some years ago, I was at a local farmer’s market and a vendor explained to me how to pick avocados. I’ve been using this method ever since. Using your index finger, gently press down on your forehead. If the avocado feels like your forehead, it's too hard. Move on. Now, press the hollow of your check. If the avocado feels similar, its too soft. Move on, it's past it's prime. 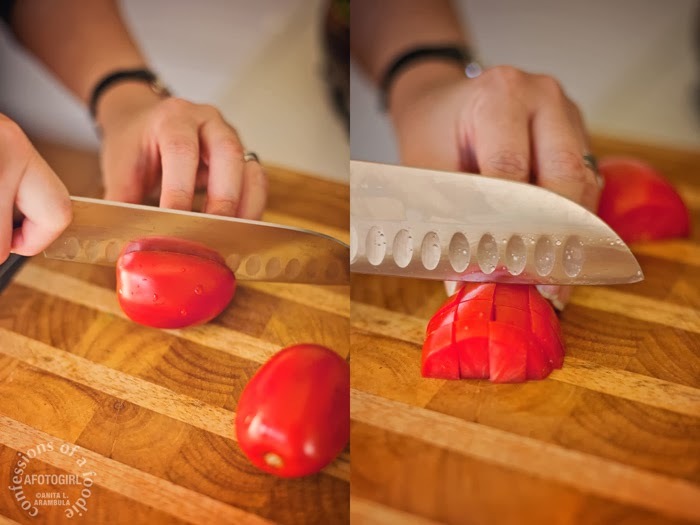 Remove the little nubby portion of the stem. Is the flesh revealed under that nub starting to turn brown? Move on. The fruit is over-ripe and most likely has started to form those unappetizing dark strings inside. If however, it's green when you remove it, then happy, happy, joy, joy! Also, a quick note, the darkest green part of the avocado that is just under the skin is the most nutrient dense of the fruit. Be sure to scrape it off before discarding the skin. 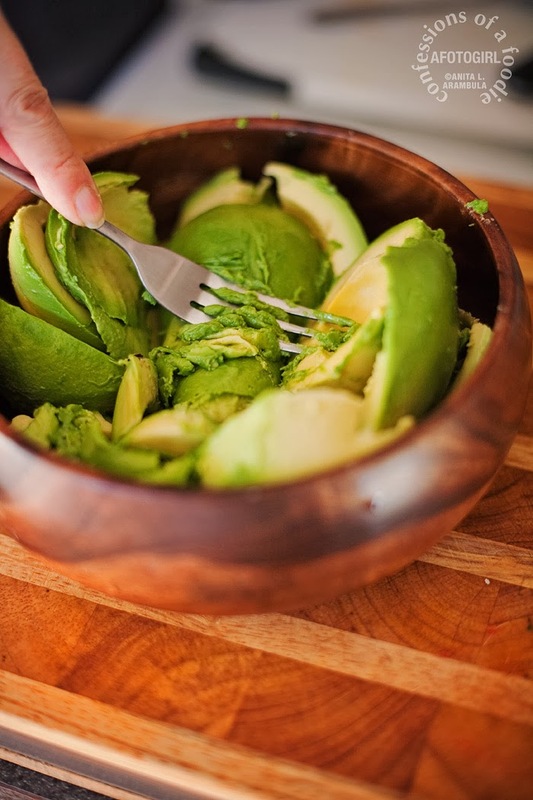 Using a large spoon, remove the flesh from the avocados and place in a bowl. Use a fork to gently mash the avocados just enough to break up the bigger pieces (you still want it a bit chunky so it has some texture). 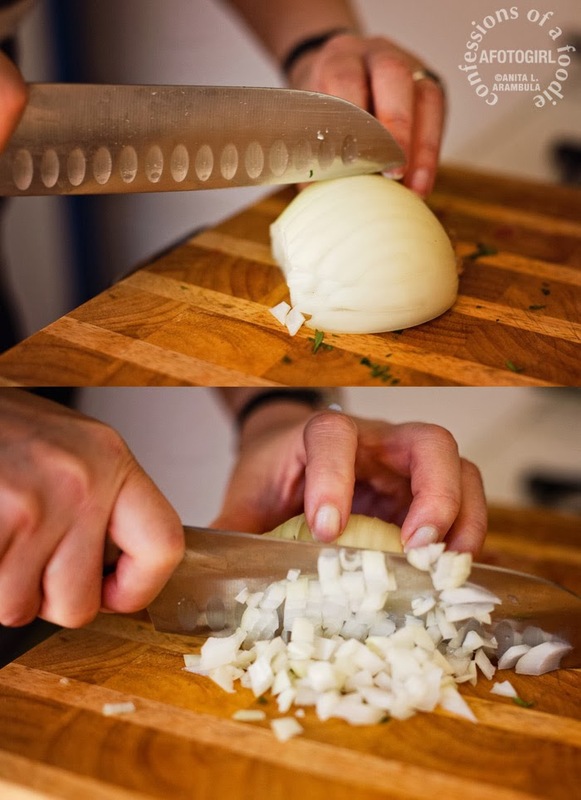 Add the rest of the ingredients. Mix gently to combine, taking care not to over mix. Wow, your photos are AMAZING!!! 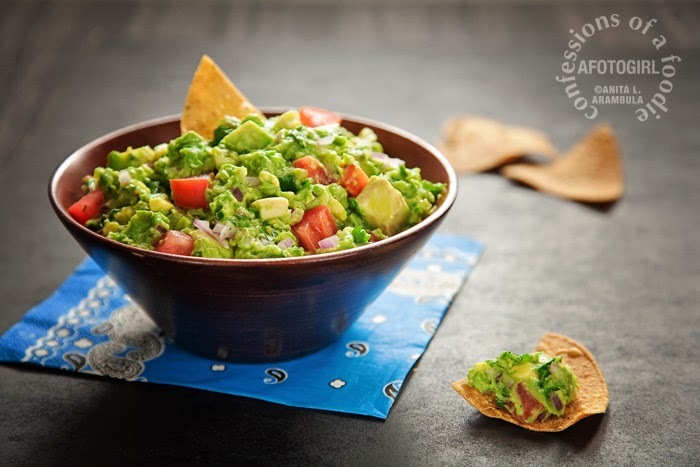 And this guac looks soo delicious--I am excited to give this a try! This would be perfect as an appetizer for our V-day party! 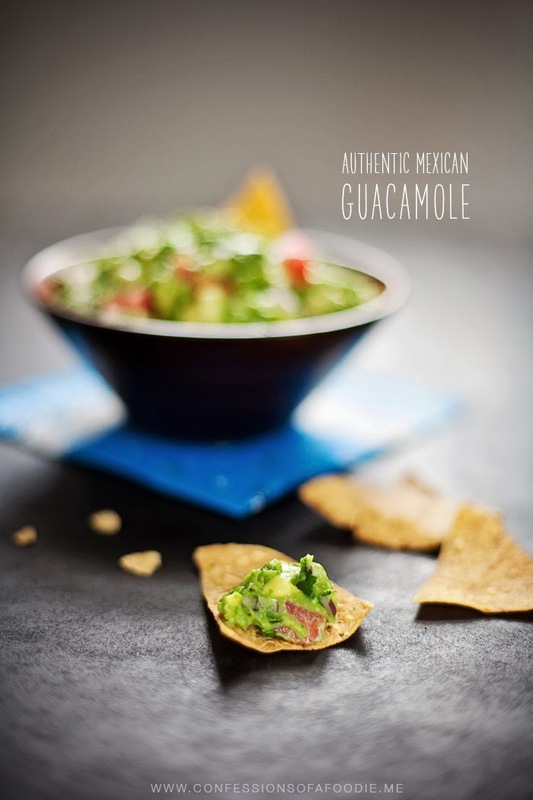 Traditional or "authentic" guacamole is simply mashed ripe avocados and sea salt. 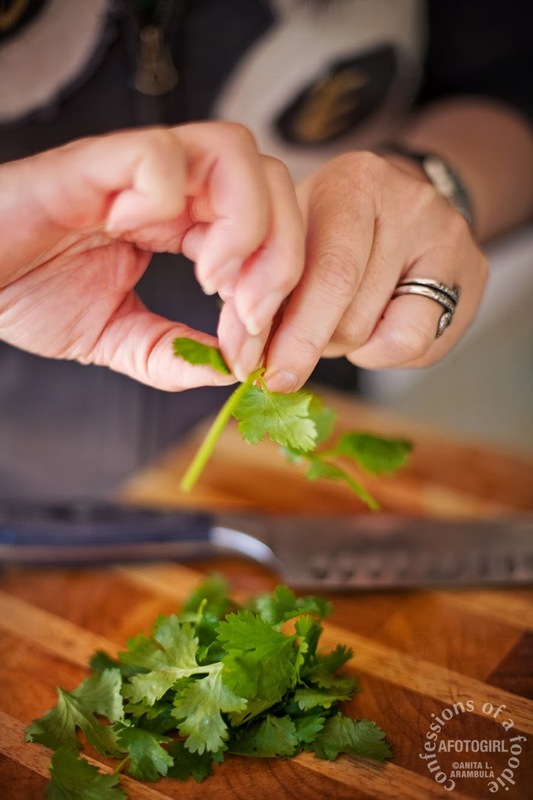 Sometimes finely chopped cilantro is added for flavor. Everything else is just an Americanized version of the aforementioned. Which in this case, tastes pretty good. Hi OSQjunkie, Thank you for taking the time to comment! A friend from peurto rico got me hooked on avocados with balsamic vinaigrette near. BUT he also sprinkled fresh shredded Parmesan in the cavity also.